Governor Andrew M. Cuomo today kicked off a statewide campaign to pass the Red Flag Gun Protection Bill, also known as the Extreme Risk Protection Order Bill, advanced by the Governor last week. The bus tour stopped at Plainview - Old Bethpage John F. Kennedy High School in Plainview, bringing together local elected officials, school staff, and students in support of the bill. In addition, Long Island leaders endorsed the bill, which would prevent individuals determined by a court to have the potential to cause themselves or others serious harm from purchasing, possessing, or attempting to purchase or possess any type of firearm, including hand guns, rifles, or shotguns. This legislation builds on New York's strongest in the nation gun laws and prior legislative efforts, and, if passed, would make New York the first in the United States to empower its teachers and school administrators to prevent school shootings by pursuing court intervention. "New York will not stand by and wait for Washington to take action against the gun violence and school shootings that have become all too common in this country," Governor Cuomo said. "Parents should not have to fear sending their children to school every day and teachers should not have to wonder if they will return home from work. Together, we can and will pass this common sense gun legislation and we will continue to fight to ensure gun violence has no place in this great state." "If a fellow colleague or student poses a demonstrable threat or danger to others, we should not enable them to own a gun," said Lieutenant Governor Kathy Hochul. "With this legislation, we're continuing our push for common sense gun measures by providing teachers and administrators with a right to report and possibly prevent a terrible tragedy. Gun violence has had an enormous toll on our communities, and New York is leading the nation in an effort to protect our students and save lives." New York will not stand by and wait for Washington to take action against the gun violence and school shootings that have become all too common in this country. The law would provide all necessary procedural safeguards to ensure that no firearm is removed without due process while ensuring that tragedies like the school shooting in Parkland, Florida and the mass killing at the Waffle House in Nashville, Tennessee are not repeated. In both of those cases, the shooter was reported by multiple sources to be disturbed and dangerous yet was allowed to purchase and possess deadly firearms. An extreme risk protection order could have prevented countless, needless deaths. Governor Cuomo previously advanced legislation to establish a ten-day waiting period for individuals who are not immediately approved to purchase a firearm through the National Instant Criminal Background Check System. Current federal law requires gun dealers to conduct the NICS background check on a potential purchaser prior to selling a firearm, which immediately provides the dealer with one of three possible notifications. These notifications include "proceed", "denied", or "delayed". In the case of a "delayed" response, the dealer must wait three days before the sale is eligible to go through, even though the FBI continues to investigate these individuals past the three-day timeframe. Oftentimes, by the time it has been determined that the potential purchaser was, in fact, ineligible, the individual has already been sold the firearm upon completion of the three-day waiting period. Extending the waiting period to ten days would allow sufficient time to complete the background check and builds on legislative efforts to ensure that only those eligible to purchase and own a firearm are able to do so. Assemblymember Jo Anne Simon said, "When a person exhibits warning signs that they pose a risk of serious harm to themselves or others, teachers, school administrators and family members often observe these signs firsthand. But in New York, even if these concerns are reported, law enforcement may have no authority to act and help prevent gun violence tragedies. A temporary Extreme Risk Order of Protection would restrict a person's access to firearms if they pose a serious risk, while providing due process protections and the right to appeal. I applaud Governor Cuomo for taking on this issue and advancing this legislation. It will save lives." Suffolk County Executive Steve Bellone said, "Governor Cuomo has consistently shown himself to be a national leader on enacting common sense gun safety measures. This most recent legislation will empower teachers--and allow them to do what they truly want to do--teach. Now is the time to stand to protect our children and end gun violence in New York once and for all, and I will work tirelessly with our local leaders to ensure that this legislation becomes law." Nassau County Executive Laura Curran said, "Students deserve to feel safe and welcomed at school while receiving the best education possible. Governor Cuomo is taking action by advancing the Red Flag Bill to safeguard our classrooms. New York leads the nation when it comes to action and I am urging our state leaders to pass this bill into law immediately." Suffolk County Legislature's Presiding Officer DuWayne Gregory- "The senseless gun violence we hear about almost every single day must come to an end. It is clear that this problem is not going to solve itself, yet Washington and our nation's leaders refuse to take action. Thankfully, here in New York, our Governor has prioritized gun reform above all else and has continued to advance legislation to keep New Yorkers safe and prevent dangerous individuals from obtaining firearms. I fully support Governor Cuomo in his fight against gun violence and mass shootings, and implore New York's legislators back this bill and get it passed." Suffolk County Legislator Monica Martinez said, "I applaud the Governor for setting an example for the rest of the nation and taking a stand at a time when our federal government has turned its back on America's youth. New Yorkers have spoken and the calls for gun safety and reform have been heard across the state and beyond. By championing this landmark legislation, Governor Cuomo is showing exactly what his priorities are, which is protecting New York citizens and ensuring our schools are a quality, safe and inclusive environment for students of all ages"
Suffolk County Legislator Bill Lindsay said, "Our top priority as lawmakers is to protect our most vulnerable population -- our children. Gun safety measures like the extreme risk protection order will empower our teachers and increase safety at school districts statewide. I'm proud to stand with Governor Cuomo in support of this legislation." Nassau County Legislator Drucker said, "Currently, we live in a time where students wonder when—not if—gun violence will occur at their school. Instead of providing bullet proof backpacks and teachers equipped with guns, we must root out the source of this violence by taking guns out of the wrong hands. I applaud Governor Cuomo for fighting for our children when Washington will not and acting as a leader for this nation to follow when it comes to common sense gun reform. This bill undoubtedly keeps New York moving in the right direction and we can only hope that the rest of the country follows suit." Town of Hempstead Supervisor Laura Gillen said, "As both a parent and a leader of America's largest township, I am sickened by the wave of gun violence sweeping across our nation. We cannot afford to sit idly by while our country averages a school shooting every week, so far, this year. 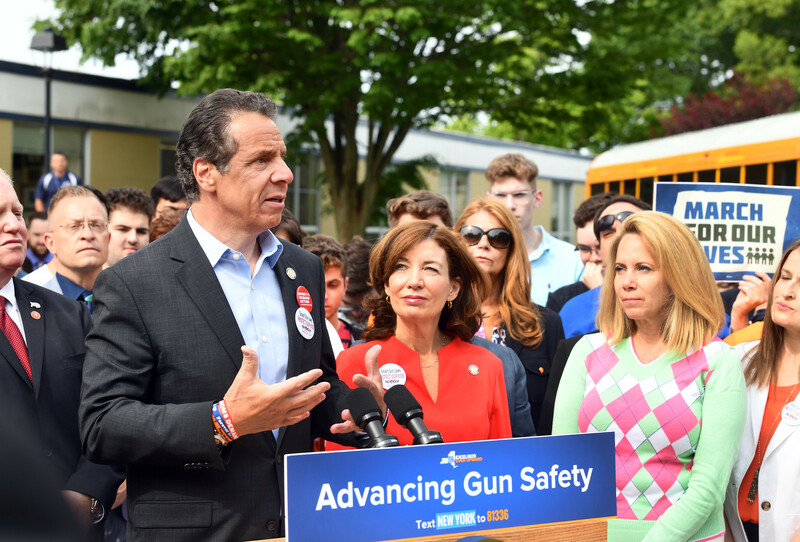 So I am proud to stand with Governor Cuomo and support his efforts to proactively increase gun safety throughout our State and address this terrible scourge before it worsens." Plainview-Old Bethpage Superintendent Lorna Lewis said, "We must put an end to the scourge of gun violence that has impacted too many of our schools. Fortunately, in New York, we have a Governor who is committed to taking action and making impactful change that will enhance safety in our schools. The Red Flag bill will save lives and bring appropriate focus on mental health. I encourage our legislature to come together in bi-partisan spirit and pass the bill the Governor advanced now before any more of our children and staff suffer."